They say the early bird gets the worm. My dachshund Barny lives by this philosophy. I often compose my reflections in the wee hours of the morning. While the other two lazy hounds (and Editor) are snoring, Barny creeps down the hall to greet me. It is not that he wants to see me; he knows that a morning Beggin Strip treat will be his and his alone if he gets there first. The early birds of the Broward have the same philosophy. The predawn light reveals the familiar shape of my Tricolored heron friend waiting patiently on the bank near the water for the sun to rise. It is low tide and the river (what is left of it) is teeming with bait minnows and shrimp. It is just too dark to see em! Just like Barny, this bird is often the first one I see in the mornings just waiting to get some breakfast treat too. Unlike most of the marsh birds, this particular Tricolored Heron does not fly off at my slow approach to the dock. He gives me a morning glance as if to say “Please don’t scare the fish”. He slowly hops down into the cold water and begins to peer into the murky darkness for tell tale signs of movement. His keen eyes were made just for this type of feeding. Later that day I see this familiar bird again at low tide. The sun is high and the visibility is just perfect for minnow hunting. This small heron does not even give me a hint of notice as I lie prone on the floating dock and watch him hunt. Peering left and right, then arching his neck like a drawn bow, his strike is just as swift and accurate as an arrow. A fat juicy shrimp is his reward, soon followed by a wriggling minnow. A Juvenile Yellow Crowned Heron (George Jr) prefers fiddler crabs benedict. It's Beggin Strips A-La-Broward you might say. I am an early bird too. Breakfast is my favorite meal. But first I feed my spirit with some quiet time and reflection. “Seek me early while I may be found” is not just a philosophy for the birds you know. And every now and then I get a Beggin Strip too! Be blessed. The early bird, a Tricolored Heron greets me in the predawn light and patiently waits..
A young Little Blue Heron is also up early..
Don't scare the fish quips the Snowy Egret! And get that doohickey outta here..
A spotted Sandpiper joins the morning hunt..
That afternoon I spot the Tricolored Heron fishing again at low tide.. I think I see one now…yep.. The heron strikes like a swift arrow..
That water is still cold though..brrrr..
George Jr, the Yellow Crowned Night Heron spots a crab..
Are they changing yet? I sure do miss seeing the changing of the color of the leaves in fall. How bout some of you northern folks send me some fall pictures? We are in the harvest season and the fall migration of birds. Some head further south for the winter, some head north (but not Snowbirds, they just go to Florida or Arizona). You know who I am talking about. Others just hunker down, put on more layers and enjoy a nice steamy cup of coffee by the fireplace like the Editor and I do in the morning. Thought I would venture out beyond the Broward again and head to the Viera Wetlands. A friend reported a migration of Green Herons in the area. We have a few that I see fly by on the Broward this time of the year but rarely do they land near the dock. The five-day weather forecast showed a post frontal high building as the best time to go. Sometimes "life" changes our plans. I couldn’t make it the planned day so I leave about 4 am the next day. Yesterday was perfect clear blue skies, should be like that early today right? Wrong! As the light begins to reveal the sky all I see are dark low clouds and rain enroute to the wetlands. I arrive at dawn and find the wetlands are closed to vehicles so I head across the street to the “Click ponds”. Sure enough there are lots of Little Green Herons feeding in the ponds. But it is just too dark to photograph. I wait and watch and have a great time as I observe them hunt for tadpoles and insects. Finally I got a small break in the clouds and capture a few photos. I also spot my first Sora. The Sora is an illusive member the rail family of birds and rarely does one get a photo I am told. As soon as it sees me it runs into the reeds to hide. I inadvertently interrupt an Osprey having breakfast. It gave me a “look” as it lifts up and flies to a more secluded tree to finish its meal. I then spot a Great Egret with a huge frog in its throat. Little Green Herons are migrating through the area of the Viera Wetlands .. I capture a brief glimpse of the illusive SORA, a member of the rail family..
Boat Tailed Grackle male sings a morning song.. I inadvertently interrupt an Osprey having breakfast. I don't read beaks but I can see a clear message in those eyes…get lost Mr Doohickey! Bet the poor frog is not enjoying breakfast either. Guess who I surprise on the dock the next morning….a Little Green Heron! Perhaps I should have just stayed home? Spunky the female Belted Kingfisher flies by giving me the eye..
What is the reason for this season in my life I wonder.. The telephone rings in the middle of the afternoon. It is an unfamiliar name with a local number but I answer the phone (something I don’t normally do). On the other end is a lady (Miss Connie) whom I had never met but who read about my bird photography hobby in the local North Jax Monthly paper. 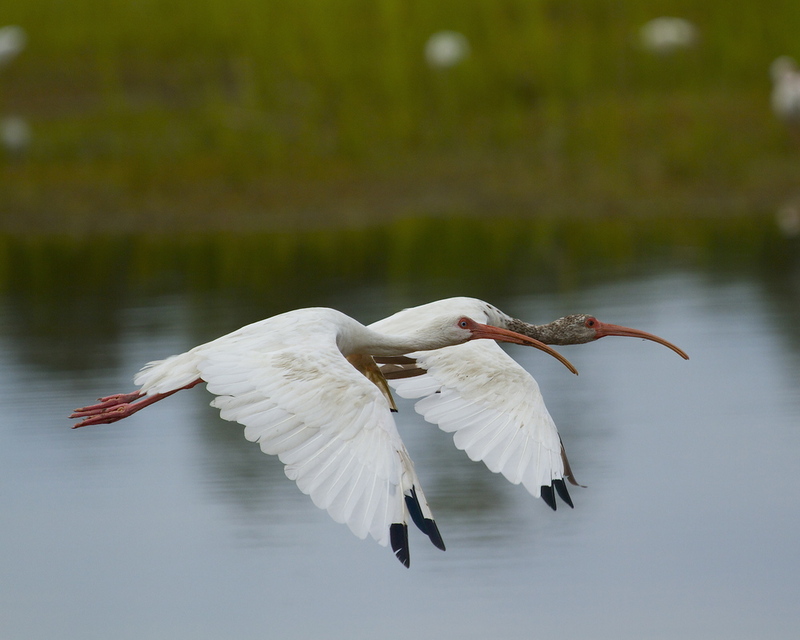 She tells me there are about a thousand White Ibis in a field across from her property on Black Hammock Island and told me how to get there. My eyes begin to open wide as I wonder what that such a flock would look like. I am somewhat familiar with the area and grab my camera, check my batteries, and head in her direction. It took me about 20 minutes to get to the spot she described. 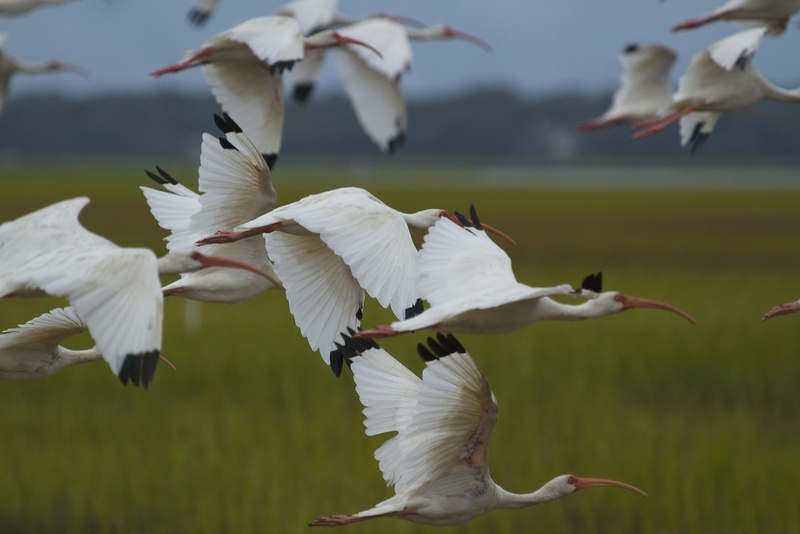 As I near the location I see small flocks of White Ibis in several fields. Miss Connie waves me down as I pull over to a field full of White Ibis. Unfortunately, the huge flock had already begun to disperse. There are still several hundred in the field but they are beginning to take wing and head on to wherever they were going. 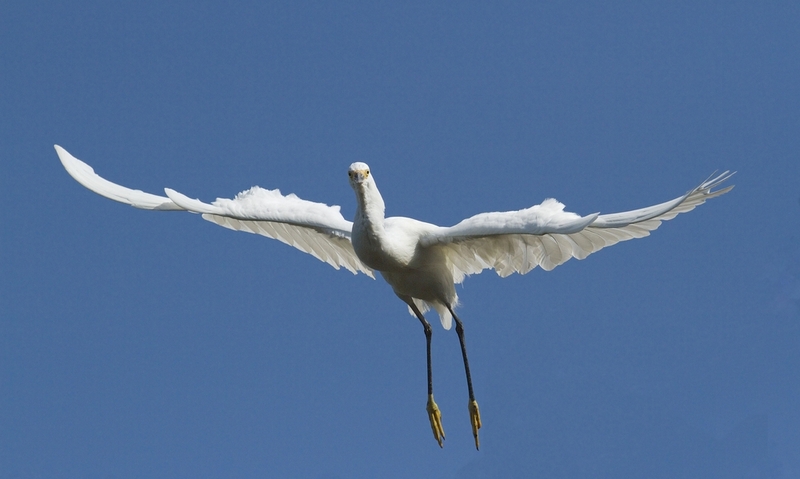 I grab my camera and begin to push the doohickey for all it was worth as I track one Ibis after another taking wing. Miss Connie explains that we were not far from the river and they might be heading in that direction. After sharing a little time and meeting Mr. Tebow (one of her dachshunds), it is back in the truck and on to the river. As I approach a bend in the road, the marsh view ahead of me is full of Ibis. I have never seen so many birds in one spot. Getting out of the truck, I begin to pan around and shoot. After a short while they again begin to lift off and fly. I am in a winged wonderland with white Ibis everywhere. Though it only lasted a few minutes it seemed like an eternity. The photos do little to show what the experience was really like. Imagine this field covered in White Ibis…just missed them, only a few hundred remain by the time I arrive. White Ibis cover the marsh as far as I can see. You have heard of synchronized swimming…this is synchronized winging. Wings of White begin to fill the air.. In a few moments the fairytale winged wonders are gone..but thanks to a strangers caring call I share this with you..thanks Connie! It is finally starting to feel like fall now. Time to bid adieu to the long hot summer and say hello there pumpkin pie! Nothing says fall like a hot homemade pumpkin pie or a steamy bowl of chili. Now that I have your mouth watering, it is time to look skyward. The show is about to begin. The fall migrations are in full swing and the sky dancers are everywhere. I love to watch birds in flight. Profile shots are great and I get plenty of them on the Broward as they hunt for food. However, it is the "birds in flight" shots that make my day. I look upriver, the morning sun at my back and see those huge brown wings going up and down in rhythmic motion. The symbol of our nation, the majestic Bald Eagle is coming right at me. I raise the camera, my finger on the doohickey and begin to focus. As the eagle gets closer and moves into “the zone” I begin to press the doohickey, carefully keeping the bird in focus and in the viewfinder. I press twice to get the upbeat and downbeat of the wings. The closer it gets the faster I press it. If I have my exposure settings correct I get a reward, if not, then it is a missed opportunity. An Osprey circles the channel and spots a fish..no…no..that is some guy with a doohickey! Caught you looking though Mr Osprey. 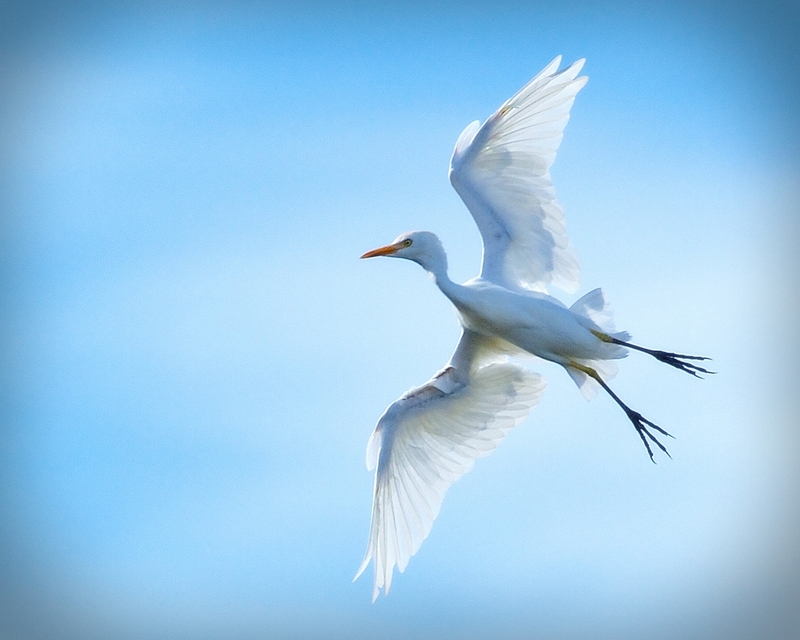 Another of my favorite places to capture birds in flight is at the St Augustine Alligator Farm. I know where they roost and just sit below the tree and watch them come and go. Their sky dancing enchants me as they gracefully spread their wings to approach and go into their varied and beautiful motions as they land or take off. No matter how hard we humans try to duplicate it, we just can’t capture the beauty of a bird in flight as it folds its wings every so quickly and graceful and perches on a limb without a hint of motion in the branch as is softly lands. Even the gawky looking wood storks can sit down so gently you would never feel its touch if you were the tree. Thanks for the dance. Corpuscular Rays from the morning sun..the show is about to begin..
No bird is more majestic to me than an Eagle in flight. Come on, have a piece of pumpkin pie and let's watch the sky dancers! Little Blue Heron (Juvenile) glides by. No, not a headless bird? it is a Turkey Vulture peering down doing the Turkey trot. The cattle Egret cowbird swing! A bow to the Maker..
Wood Stork landing…I feel pretty! A pink angle's sunlit Plie. Hope you enjoyed the dance..
Is that a pumpkin pie I spy? Yum Yummm.